To have a pin prick rouse me. 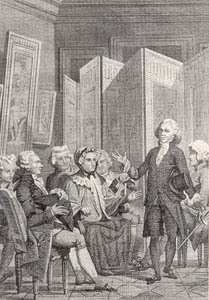 Jacques Delille (June 22, 1738 – May 1, 1813) was a French poet and translator. Malheur at Pitié (1803), canto I.
Qu'à coups d'épingle on me réveille. La Conversation; reported in Hoyt's New Cyclopedia Of Practical Quotations (1922), p. 815-16. L'Immortalité de l'Âme; reported in Hoyt's New Cyclopedia Of Practical Quotations (1922), p. 825. Imagination, IV; reported in Hoyt's New Cyclopedia Of Practical Quotations (1922), p. ___? (Silence). des honneurs solennels vous paîront vos bienfaits. tr. of Ignari hominumque locorumque erramus, vento huc vastis et fluctibus acti: multa tibi ante aras nostra cadet hostia dextra. — L'Énéide, livre premier (Virgil A. 1.325)"
Instruct us of what skies, or what world's end, our storm-swept lives have found! Strange are these lands and people where we rove, compelled by wind and wave. Lo, this right hand shall many a victim on thine altar slay! — Vergil, Aeneid. Theodore C. Williams. trans. Boston. Houghton Mifflin Co., 1910. But tell a stranger, long in tempests toss'd, what earth we tread, and who commands the coast? Then on your name shall wretched mortals call, and offer'd victims at your altars fall. — Vergil, Aeneid. John Dryden. trans. This page was last edited on 5 February 2018, at 17:01.